Peruvian Kids are specialists in unique items of ethically produced children’s toys and clothing which are all hand crafted by artisans in Peru. Their colourful children’s cardigans, called arpillera jackets are based on the traditional South American art of tapestry making. They are all hand finished in Peru by local artisans, so no two garments are the same. or visit them at York’s Newgate Market – every Tuesday, Friday, Saturday and Sunday. 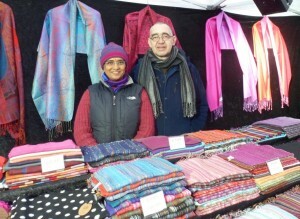 Based in the heart of Yorkshire, York Scarves is a fair trade wholesaler with close links to their producers. From small beginnings in 2007, York Scarves has grown into a thriving BAFTS registered fair trade UK enterprise which specialises in the weaving and supply of wholesale scarves, pashminas and shawls from India and Thailand. York Scarves is now one of the UK’s premier wholesale scarf suppliers. York Scarves spends time each year in India with their weavers working on designs for the coming season and through their hands-on style of business they know their scarves are fair trade in the true sense of the word. York Scarves welcomes all retailers to check out their website. The Fairtrade Foundation has launched the Make Food Fair campaign. This is part of the national Enough Food IF campaign. The Make Food Fair campaign concentrates on supporting small scale farmers. Despite producing 70% of the world’s food, over half of the world’s hungry people are smallholder farmers, who struggle to earn a decent livelihood from their crops. Focus in government funding – meet internationally agreed targets for government spending and aid for agriculture, and ensure this reaches smallholders, especially women. 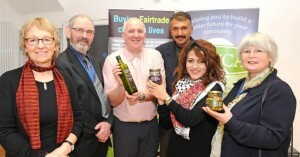 Fairtrade Keighley is the latest Fairtrade Town campaign in the Region. The Chair of the campaign, Richard Dillon, stated that he was inspired by Yorkshire’s successful campaign to be the UK’s first Fairtrade Region. He is now pulling out all the stops to make sure that Keighley joins the growing ranks of Yorkshire Fairtrade Towns. Richard plans for the campaign to work closely with the town’s retailers and help promote Keighley town centre as a shopping destination. Fairtrade Keighley has received strong support from the Cooperative in the area. Fairtrade Fortnight was a great success in Keighley with the highlight being a breakfast meeting with a talk from Fairtrade olive farmers, Manal and Odeh from Palestine cooperative, Zaytoun. 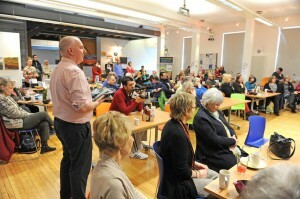 There was also a screening of the Fairtrade movie, Black Gold, which gives a fascinating insight into the coffee trade. This took place in Central Hall with the assistance of Keighley Film Club. A packed Central Hall for the olive growers’ talk. Email us if you would like more information on the exciting Fairtrade Keighley campaign. The Shadow Home Secretary, Yvette Cooper MP called into the Cooperative store in Castleford to meet with Cynthia Dickinson from Fairtrade Wakefield. Cynthia Dickinson presents Fairtrade rice to Yvette Cooper. 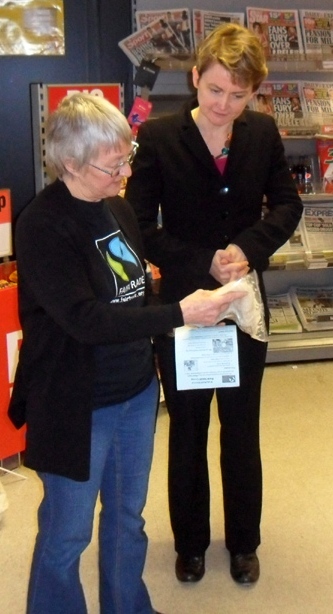 Yvette was presented with a bag of delicious Fairtrade rice which she said she would look forward to eating with her husband, the Shadow Chancellor, Ed Balls. This Fairtrade Fortnight, Zaytoun Olive farmers, Manal Abdallah and Abu Rafat (AKA. Odeh), toured Yorkshire to talk about how Fairtrade has made a difference to their livelihoods. 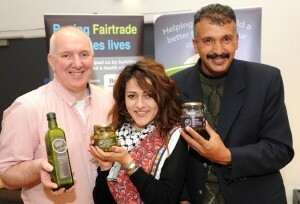 Richard of Fairtrade Keighley, Manal and Odeh. They brought with them some stunning images of 2,000-year-old olive trees and farming life in Palestine. Fairtrade has made a huge difference to them – all exports from Palestine have to go through checks and transfers imposed by Israel, which rendered it extremely difficult to export until the Fairtrade movement stepped in to help trade to take place. Now they can not only export olives and olive oil, but couscous, sun-dried tomatoes and other foodstuffs. These are often produced by the women of a family, which improves their standing and also brings in a second source of income. 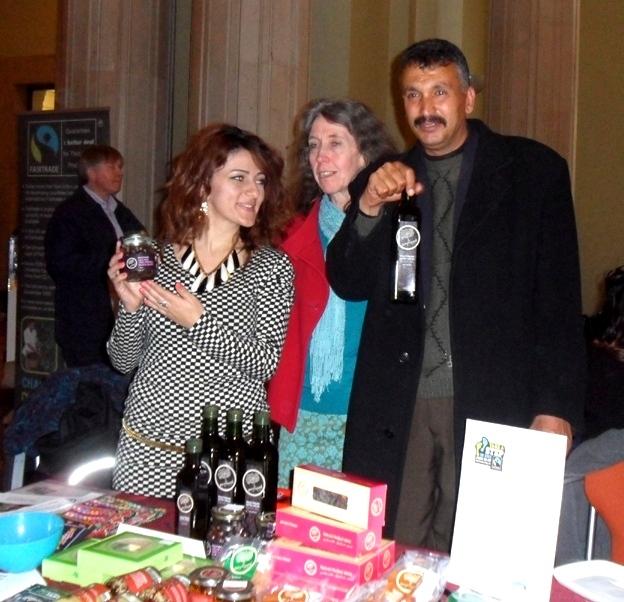 The University of Leeds marked Fairtrade Fortnight with a special day of celebrations which included a Fairtrade and Craft Fair in the Parkinson Building. Manal and Odeh, Zaytoun olive farmers from Palestine, visited the Fair and gave a presentation. Manal, Hilary (who sells Zaytoun products in the UK) and Odeh at the University of Leeds Fair. The University of Leeds is proud of its Fairtrade University status. Conferences and catering manager, Bev Kenny, goes out of her way to ensure that the university supplies Fairtrade products to its students, staff and visitors. The university is an excellent example of a community coming together, to do what it can, to ensure that producers in poor countries get a fair deal. So much so, that the University of Leeds was chosen by Fairtrade Yorkshire as our regional flagship employer. 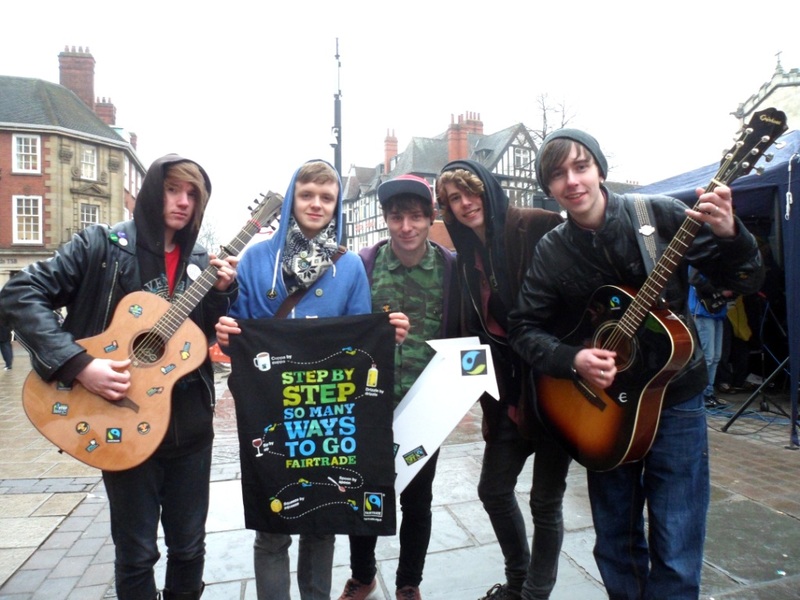 York shoppers were treated to the soulful sounds of Access To Music students at the City’s annual Fair Trade Market on Friday 8th March. The varied programme put together by the students sent shoppers feet tapping and a few hips swaying. Margot Brown of Fairtrade York commented that the set was a great asset to the Market and raised many smiles on a day of cold, grey weather. The students were true professionals and the show went on throughout the rain. Find out more about Access to Music. They have courses for those who want to work in the music industry, at several sites across the UK. Twin Fairtrade towns Malton and Norton have enjoyed a successful Fairtrade Fortnight. Alison Hardwick and her hardworking team of stalwarts have been joined by Guardian blogger, Janice Gwilliam. Together they helped organise a Fair Trade craft fair at the Friends Meeting House in Greengate. 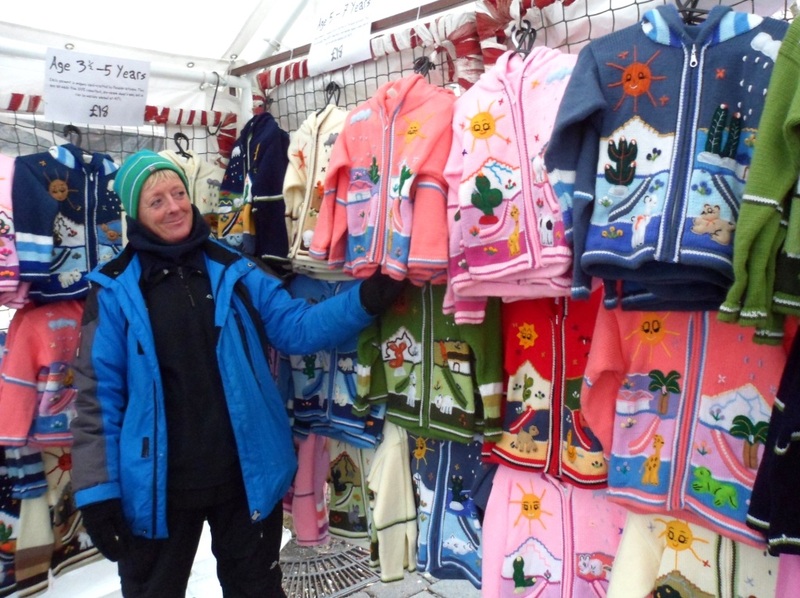 A wide range of Fairtrade crafts were on sale alongside crafts produced by local artists and craftsfolk. 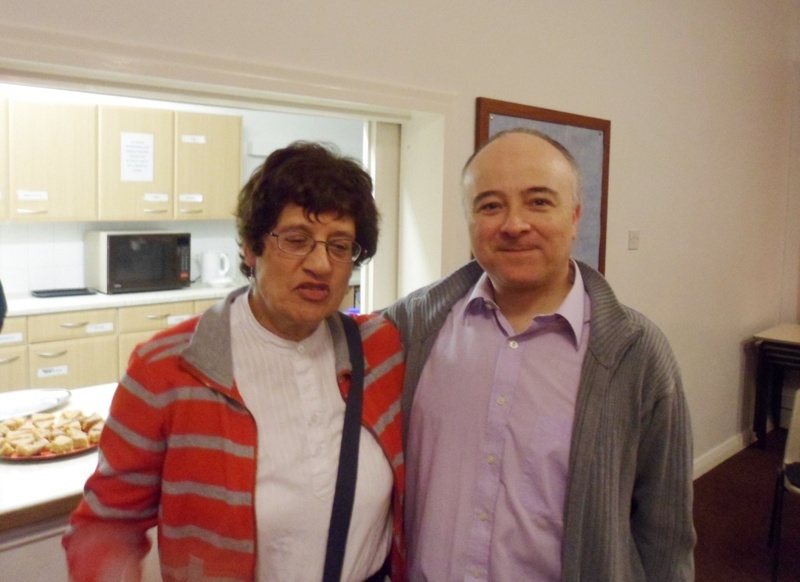 Janice Gwilliam of Fairtrade Malton and Norton with Fairtrade Yorkshire’s Mark Dawson.